Getting there: To approach from the west as we have filmed it, involves a complex routing. Starting at the southern end of Pilgrim's Rest, just after crossing the old stone bridge, turn right at GPS S24.898754 E30.750645. Drive south-west for 1,8 km till you arrive at a fork at GPS S24.912598 E30.746024. Keep left at this fork and follow this road first into the south and then into the west for 0,8km to arrive at a second fork at GPS S24.915342 E30.941986, where you must turn right. Follow this road in a generally south-easterly direction through large areas of plantations for 3,3 km to arrive at a 4 way intersection at GPS S24.933133 E30.748808 where you must turn right. Drive WNW for 800m to the next intersection, where you must turn left and cross the bridge. Immediately after the bridge there is a fork at GPS S24.933113 E30.747574. Keep left at the fork and follow the road along the western bank of the river for 1,6 km to arrive at a T-Junction at GPS S24.945846 E30.745601 where you must turn left. 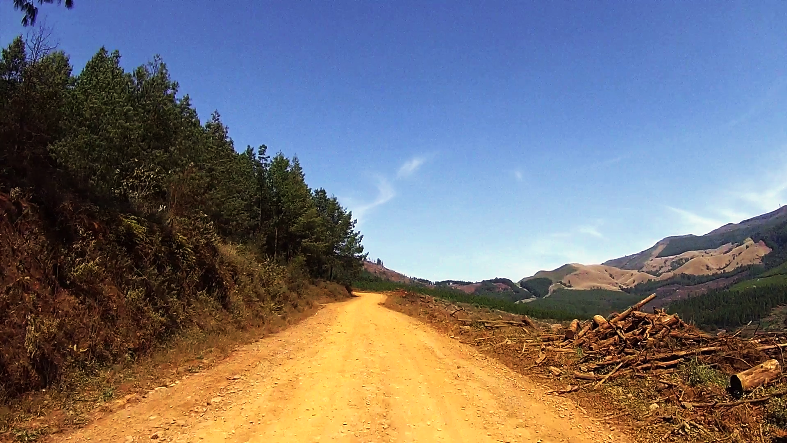 Drive for 800m into the south-east (this section is marked by tall trees on either side of the road) until you arrive at the next fork at GPS S24.950805 E30.750460 where you must turn left again. Drive south-east for 3,2 km to arrive at the western start of the pass. 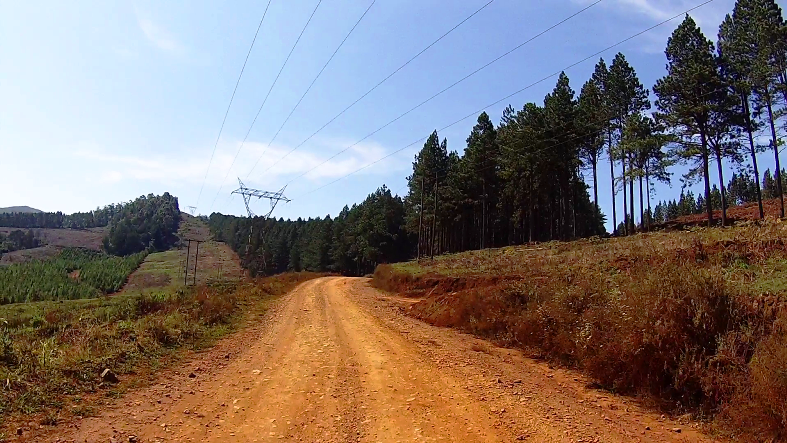 For those approaching from the east, head west out of Graskop on the tarred R532 following the signs toward Sabie for 11,5 km and turn off the R532 onto a gravel road at the apex of a big left hand bend at GPS S24.969409 E30.804961 which marks the eastern start of the pass. Pass Description: The pass starts at its western end at an altitude of 1353m at the crossing of a small stream, The Grootfonteinspruit and immediately begins climbing via a wide left hand bend at a gradient of 1:10. The heading changes briefly into the north as the road enters a tight right hand bend at the 0,6 km mark. This bend curls through a full 120 degrees. A smaller road leads off to the left at the apex of this bend. There are many side roads leading off this main pass, so be careful not to take any of them, as once you are off the main road, there is no signage and it's very easy to become disoriented in the maze of forestry roads. After an easy right hand curve a prominent fork appears at the 1 km mark. Make sure you keep left here. This is the most likely point drivers will make a mistake, so make a note of this before setting off to drive this pass. After the fork at the 1,1 km point, the road, which is still climbing steadily at 1:10, curves through another big left hand bend of 150 degrees, which changes the heading into the north-east. This doesn't last long and at the 1,5 km mark the road bends gently into the ENE, then follows a number of easy bends as the ascent continues relentlessly towards the summit, which is reached at the 2,3 km mark at an altitude of 1516m at a wide right hand bend of 90 degrees. It's best to premark the summit point as it is (currently) inside a dense plantation and will not be immediately obvious. Two famous hiking trails are located nearby. The Fanie Botha Hiking Trail (one of the first to be established as part of the National Hiking Way System) more or less follows the route of the pass but slightly to the south and the Prospectors Hiking Trail actually crosses the pass near the summit point, so be aware of hikers. The descent starts immediately still maintaining a gradient of 1:10 and heads into the ESE. At the 2,8 km mark, the road reaches a watershed point, where another 90 degree right hand bend leads into the most technical section of the pass - a chicane style double switchback. At the time of filming in 2018 the forests had been cleared and it currently provides good views down over the forest clad valley below. Slow down for the chicane section, which consists of two major bends of 170 and 180 degrees respectively. 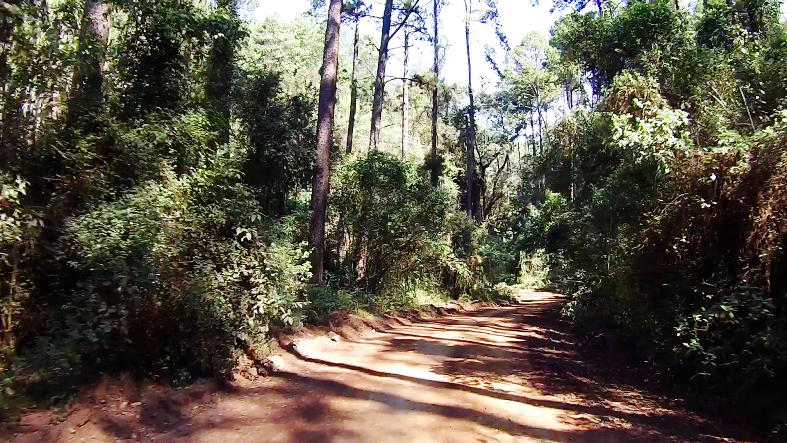 At the end of the chicane section, the road plummets into a dense forest and soon crosses a small side stream, then swings to the right and heads directly into the south. This is one of the most enjoyable parts of the pass. Roll down your windows, slow down your speed and listen to the birdsong. The one and only true hairpin on the pass is reached at the 3,8 km mark, where there is also a double stream crossing. The next section of just over 0,5 km is the steepest on the pass, where the gradients reach 1:5. If it's been raining and you are not in a 4WD vehicle, traction will definitely be a problem here. The road heads into the ESE then enters a major right hand bend of 150 degrees but the radius is wide, so it's not a big problem. This is soon followed by an even bigger left hand bend of 160 degrees radius, which eventually straightens out into the east, where the gradients ease off and the pass ends at the 5,7 km point at an altitude of 1341m at a T-junction with the R532. Turn left to go to Graskop or turn right to reach the Mac Mac Falls. 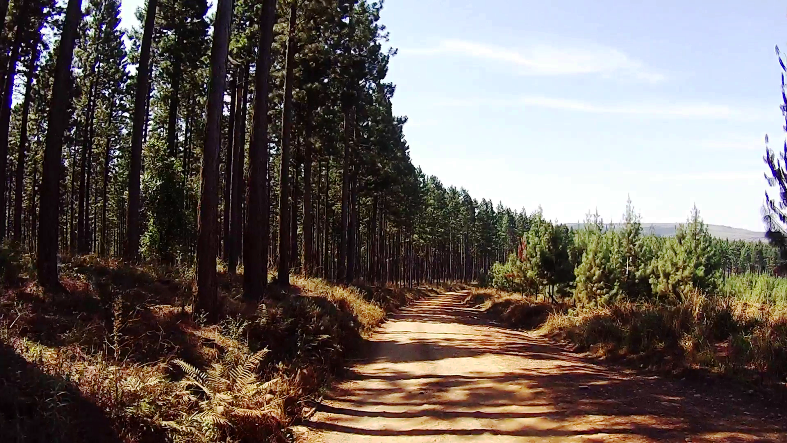 Forestry: South Africa has a plantation area of more than 1.5 million hectares, representing only 1.2% of the land area. This percentage compares poorly to the 30% of the USA and the 67% of Japan. One of the largest afforested areas in South Africa (an area of 0.6 million hectares) is in the Mpumalanga province. The Forestry Industry contributes 8.7% of the gross value of the country's agricultural output. The plantation forests of South Africa use just 3% of the country's total water resource. Irrigation, which is the norm in the growing of many agricultural crops, is never utilised in forest plantation management. The rainfall, therefore, needs to be higher than 750 mm per annum to sustain commercial forestry.